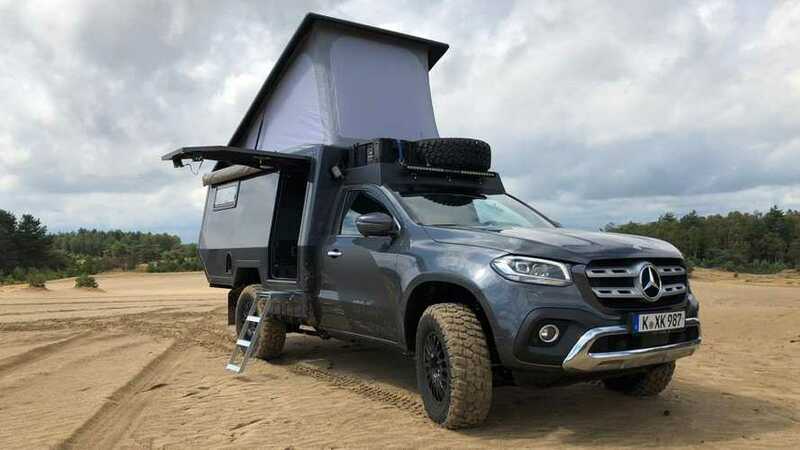 The German firm Matzker generally specializes in prepping Land Rovers for overland adventures, but its latest undertaking uses the Mercedes-Benz X-Class as the basis for a rig to go camping in the wilderness. In place of the pickup bed, there's an angular camper shell, complete with a kitchenette so you don't need to build a fire to cook dinner. On the outside, Matzker's X-Class camper features a vertically opening door that sort of evokes the famous 300SL Gullwing. When occupants step inside, they find a utilitarian look with industrial, brushed metal finishes. The conversion allows for access to the truck's cab, so someone can rest in the back and still easily communicate with the driver. When making something to eat, the kitchenette includes two gas burners, a sink, and small refrigerator. There's also a seating area that converts into a place to sleep, complete with an opening hatch for enjoying nature. An optional, roof-mounted bed allows for more folks to spend the night inside the vehicle. Sorry, there's no bathroom, though. Matzker also installs a few upgrades to make sure the X-Class is up to off-road work. For example, the suspension has a higher ride height than stock, and the firm fits a locking rear differential. Folks planning to go farther away from civilization can load up this camper with helpful options. Matzker offers equipment like a roof-mounted solar panel, recovery boards, spare wheel carrier, hot water system, and larger diesel fuel tank for increased range. Prices for Matzker's camper conversion start at 89,900 euros ($102,000 at current exchanges rates), plus an X-Class donor vehicle. Fully loaded examples can cost over 180,000 euros ($205,000). The price is undoubtedly steep, but the figure is in line with similar overlander conversions like the GEV Ram-based Adventure Truck for $198,000 or the Mercedes-Benz Sprinter-based Winnebago Revel 4x4 for $134,799.